I know I post chicken recipes often but there are so many ways to fix it and quite simply it is delicious. 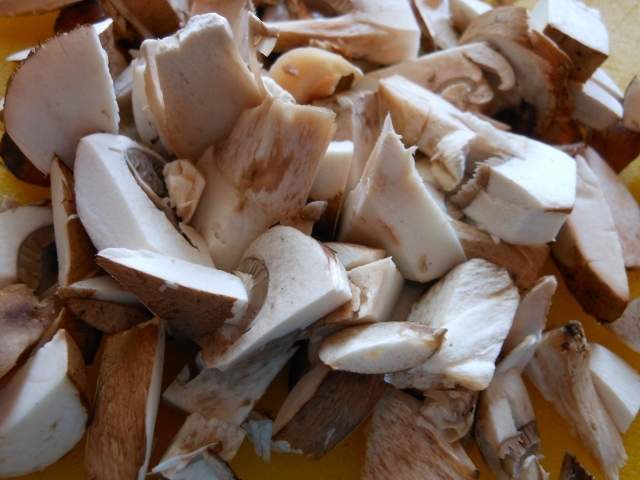 Today I started by sautéing some mushrooms to make a flavorful base then added the sliced chicken to the broth for poaching. I went with rice and broccoli and I seasoned with rosemary, but thyme would be delicious too. 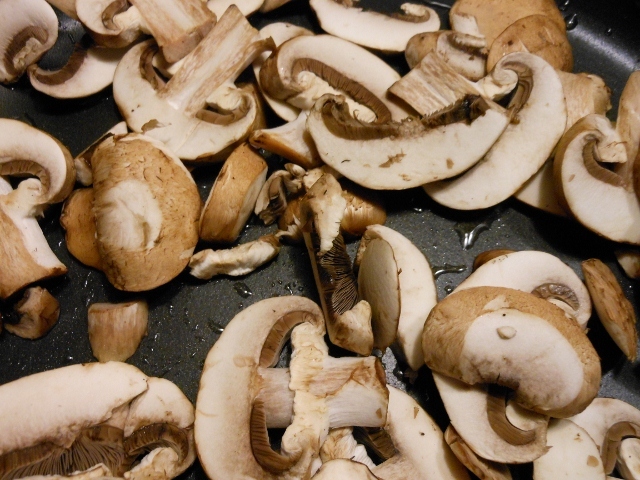 In large skillet sauté mushrooms in olive oil over medium high heat for about 8 – 10 minutes until tender and starting to brown. Season with salt and pepper, add water and rosemary and bring to simmer. Add chicken and garlic and reduce to medium low cooking for about 3 – 5 minutes or until chicken is just cooked. 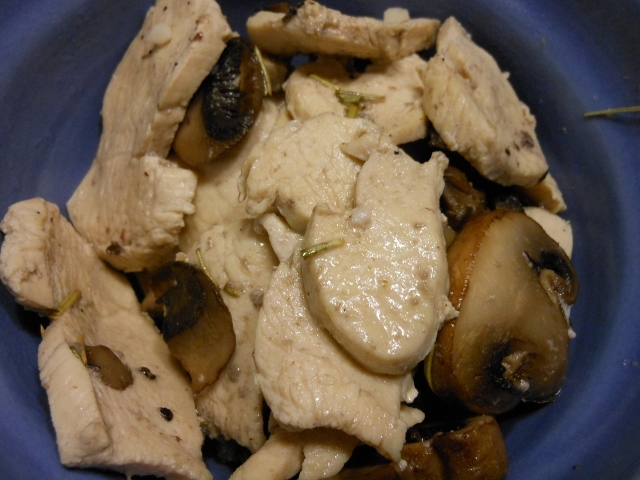 Remove chicken and some of the mushrooms from the broth in skillet; cover and set aside. Add rice to broth and begin cooking for about 5 minutes. 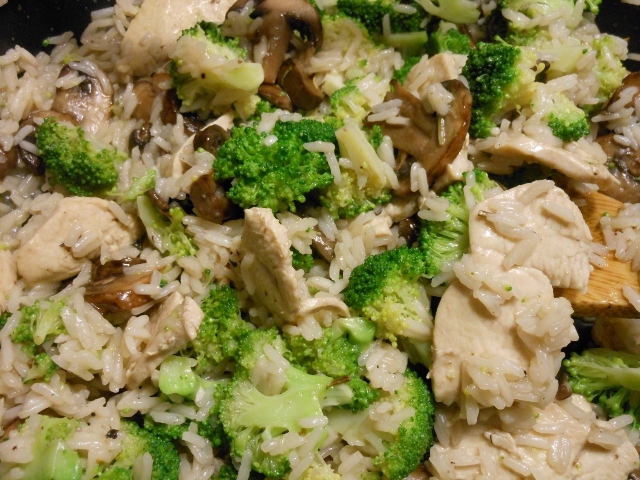 Add broccoli florets and cook an additional 10 – 15 minutes or until rice is tender. Stir in chicken and mushrooms; heating through if necessary. Season with additional salt and pepper if desired. I set out looking to make something with chicken and a veggie yesterday. The asparagus looked lovely at the store so I couldn’t resist; but this would be delicious with broccoli, green beans, or any of your favorite vegetables. 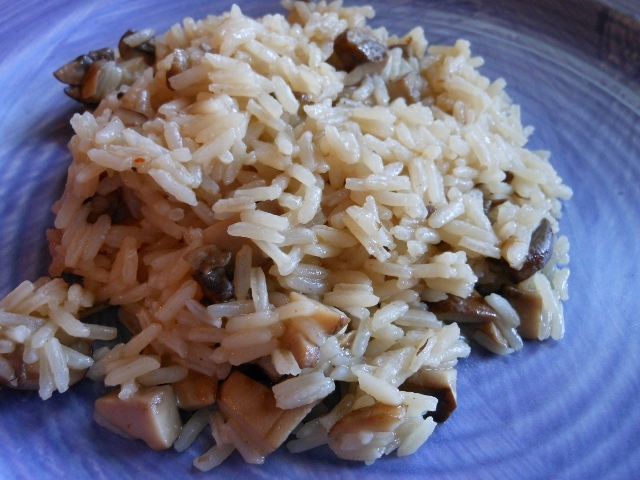 I served it over the mushroom rice I posted yesterday but even just plain rice will be lovely as this had a nice flavor from the chicken stock and mushrooms. In large skillet heat olive oil over medium to medium high heat. 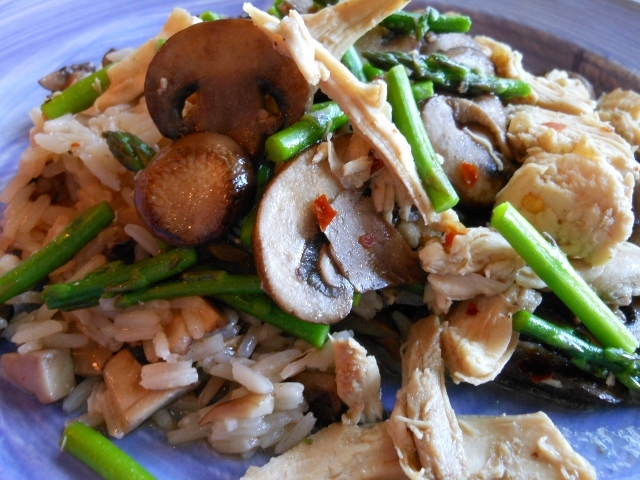 Add mushrooms and season with salt and pepper (and crushed red pepper if desired). Saute mushrooms for about 5 minutes until tender and starting to brown a bit. Add chicken stock and simmer for about 5 minutes. Stir in cooked chicken and heat through. 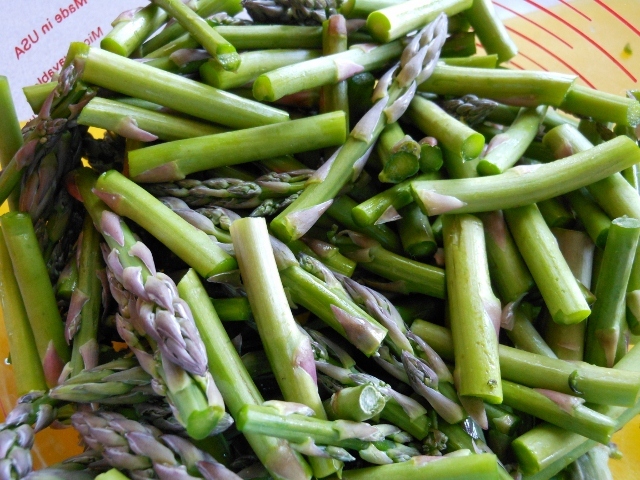 Add asparagus and cook for about 4 – 5 more minute or until desired tenderness. Serve with rice if desired. 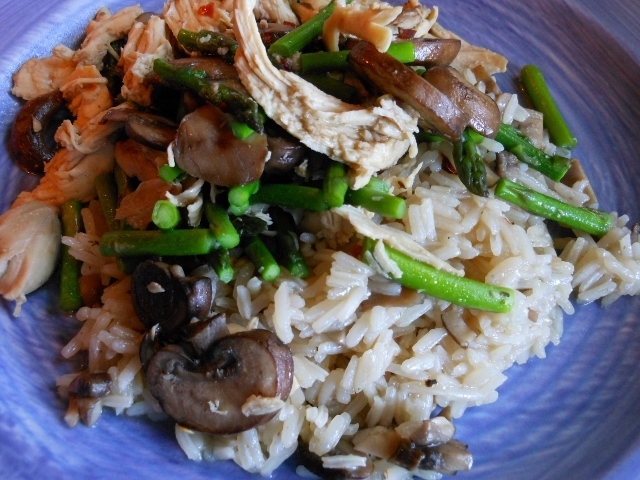 This rice was so easy to make and full of flavor. I used some homemade chicken stock and fresh mushrooms. I also prefer jasmine rice. 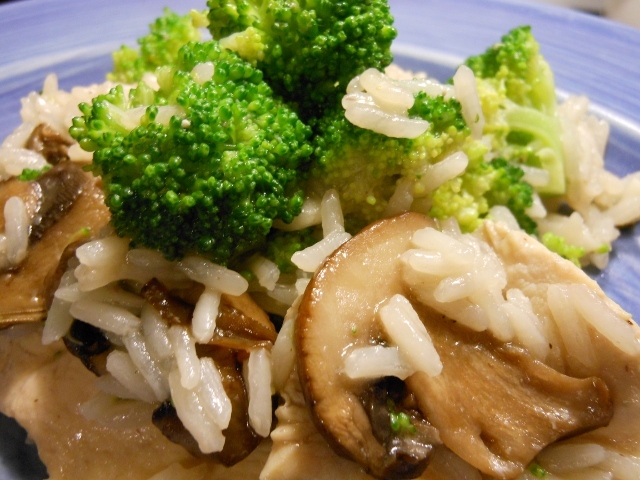 It’s a long grain rice that cooks for about 15 minutes; has a bit of a fragrant nutty flavor. Bring chicken stock and mushrooms to boil. Add rice and reduce heat to a simmer. 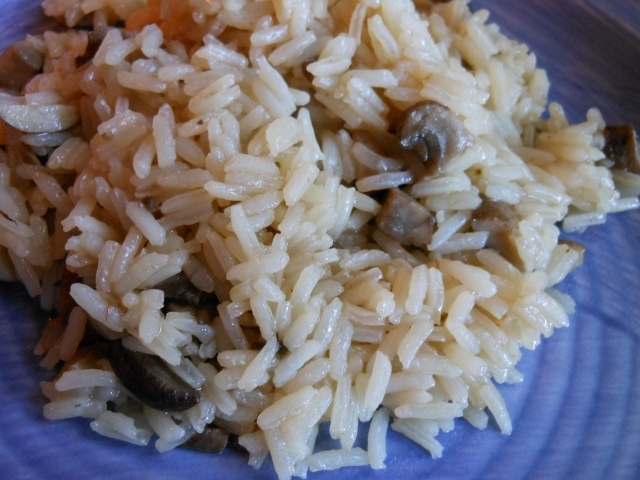 Cover and cook 15 – 20 minutes depending on rice; until desired tenderness. 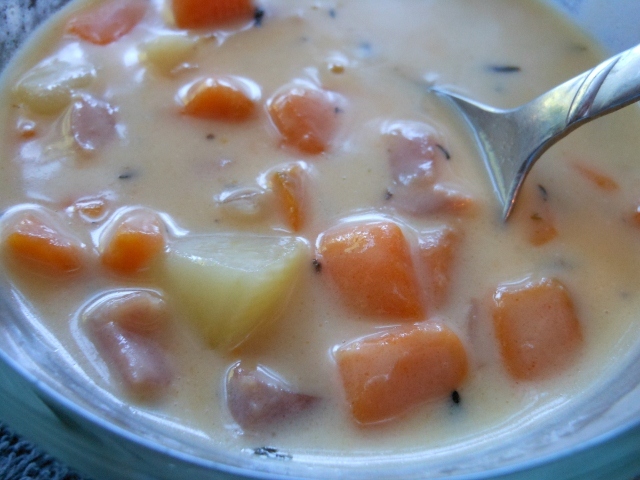 I made some sweet potato chowder to take to my mother-in-law’s house today. She’s been under the weather and I thought soup might hit the spot. I debated between chicken noodle and sweet potato chowder but the chowder won out. I love this soup. A lady I used to work with made this quite a bit; it’s always a favorite at the restaurant. Our ham at work is baked in a sugary glaze so that makes it sweeter but any ham works great whether sweet or salty. Just go with flavors you love and it will turn out perfectly. If you like it spicy it is wonderful with a diced jalapeno added at the beginning to but I thought I’d go milder for today’s lunch. Bring chicken stock to a boil and add potatoes, onion, and seasonings. 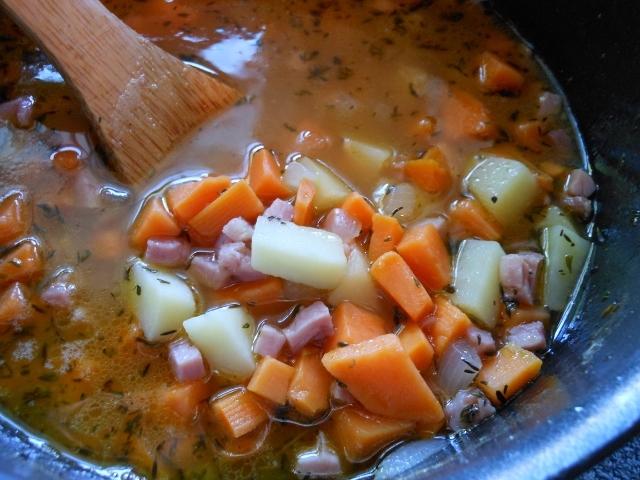 Simmer for about 15 minutes or until veggies are just tender; stir in ham. 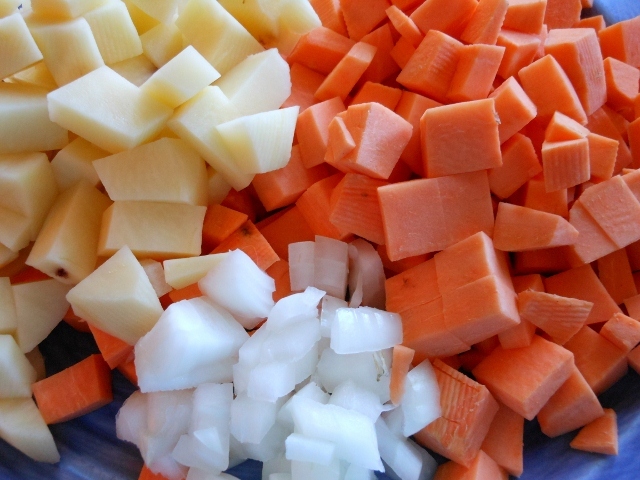 Combine cornstarch and cool water and add to soup; over medium heat stir until thickened about 1 minute. Add cream and heat through. I decided to fry chicken tonight. I am by no means a great chicken fryer; my mom however makes some mean fried chicken. I thought I’d give it a go with the chicken legs I had in my refrigerator though and it came out pretty good. There are hundreds of different ways and techniques for frying chicken. I think I should have used more seasoning. Perhaps next time I will season the chicken with the salt and pepper before dipping in the flour. All and all not bad. 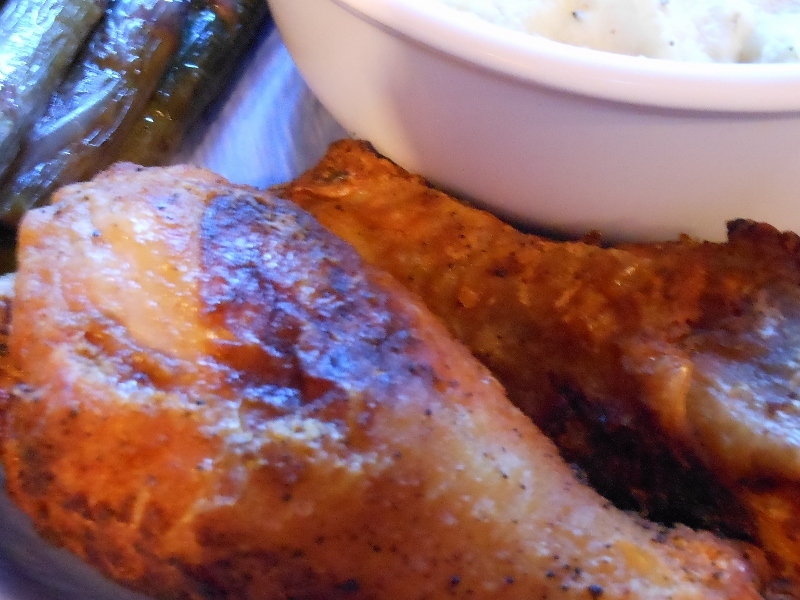 Don’t be afraid to give chicken frying a try! Heat oil in medium skillet over medium heat till hot; oil should be about 1/4 – 1/2 inch deep. Mix together flour and remaining spice ingredients. I test my oil with a little of the flour to see if it sizzles; I also checked today with my thermometer and it read about 325 degrees (a little hotter by the time I actually got the chicken in the pan. 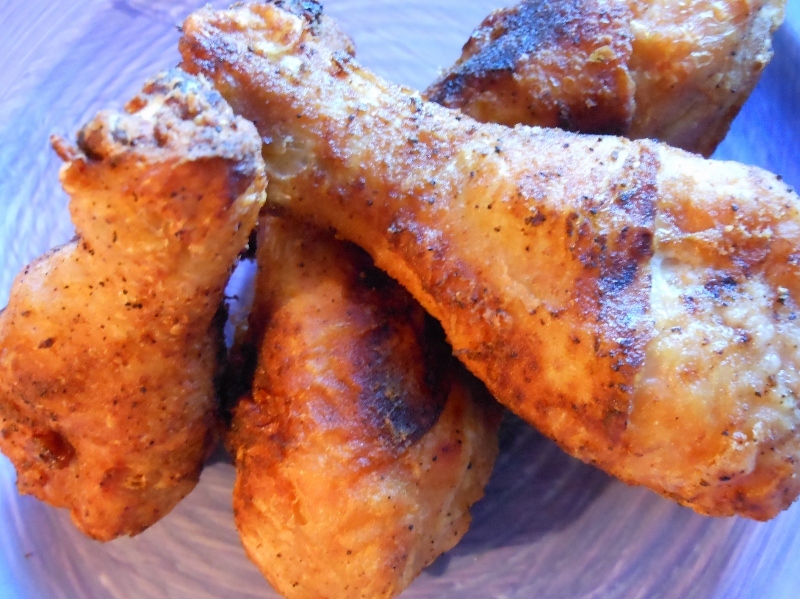 Once oil is hot dip chicken in flour and spice mixture and place in frying pan. You will likely need to decrease the burner temperature as you go so as to keep the chicken from “popping” hot oil at you. I had rather large legs and cooked them for 10 minutes on the first side flipping over and cooking another 5 minutes. I cooked an additional 5 minutes turning the chicken about a 1/4 turn to hit the lightest side. My chicken was actually a bit hotter than recommended; my thermometer read 175 degrees; 165 is minimum recommended on most recipes. Juices will be clear when chicken is done and meat will be firm.